Welcome to our blog and thanks for stopping by. Mirelez Wellness Dental wants to offer you some easy hints when caring for your teeth. 1.Do… remember you are just wiping the plaque away before it turns to tartar. 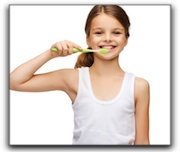 A gentle toothbrushing at the correct angle can gently wipe the bacteria away. Once plaque has settled into tartar, no amount of scrubbing at home can responsibly remove it. Don’t… scrub your teeth and gums until your gums recede and expose parts of your tooth you don’t want exposed. 2.Do… remember your gums need to be cared for. Proper brushing and regular flossing can keep your gums healthy and strong. Don’t… wait to see your a dental professional about sore or bleeding gums, tooth sensitivity or mouth sores. 3.Do… create a routine for brushing and flossing that leaves ample time to spend a full two minutes gently cleaning all the nooks and crannies of your delicate mouth. Don’t… forget to have a new floss package ready to use when your current one runs out. Waiting days to get to the store for more can disrupt a good routine. 4.Do… make regular dental visits for cleaning and examination by a professional. Call Mirelez Wellness Dental to set up your initial consultation today. 559-435-3113 We’ve got the phones ready! Cancer screenings, cavity checks and removal of tartar from the teeth are vital to maintaining a healthy mouth. Don’t… worry if you don’t have the healthiest of mouths. Mirelez Wellness Dental can help you get back on track. Whether you’re looking for cosmetic dentistry, dental implants, or porcelain veneers, we can restore what has been lost or counsel with you on the best options. If teeth whitening or sedation dentistry is what it takes, then we are equipped and ready to serve the Medera, Selma, Oakhurst communities. Don’t… put off coming in to find out about the possibility and cost of cosmetic dentistry, implants, veneers, braces, etc. All in one location, one doctor, one appointment!